Skydiving is the action sport of exiting an aircraft and returning to Earth with the aid of gravity. It is also known as Parachuting & it became an international sport in 1952. Parachuting is performed as a recreational activity and a competitive sport, as well as for the deployment of military airborne forces and occasionally forest firefighters. Aircraft: Cessna 172R or Cessna Caravan 208 (Depending upon the number of jumps per day). Safety: Instructors & equipment's are affiliated from USPA. NOTE:- It’s a limited period offer. Bookings will close on 31st October 2017 All bookings are on First Come First Serve basis. 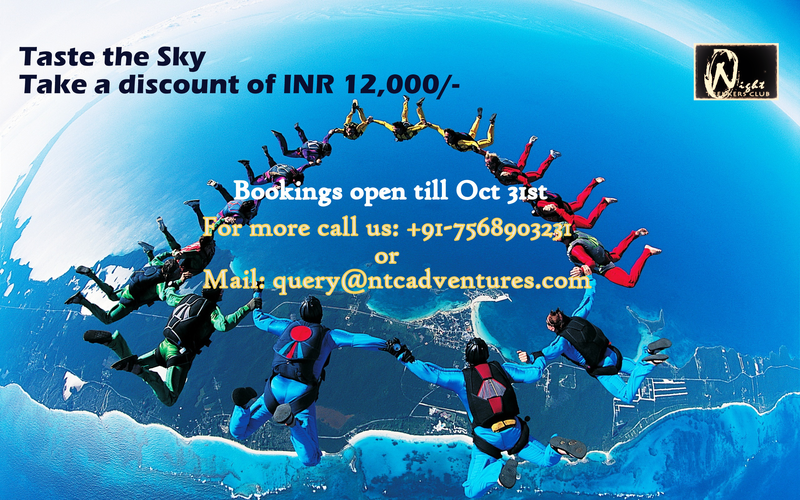 Just pay the advance amount of INR 10,000/- to book your Dream jump & pay the rest on spot. Training time: 30 minutes before the jump. 1) Candidate must be at least 18 years of age. 2) Strictly prohibited patients with epilepsy, heart problems, bone injuries/medical conditions or acute asthma, high blood pressure, fear of height, or if you are pregnant. 4) A medical fitness certificate form a certified Doctor for this activity. 4) All type of permissions. 1) Any type of expenses which are not related with this activity. 1) Cancellation 30 days before the event, 75% amount will be granted. 2) Cancellation 15 days before the event, 50% amount will be granted. 2) No Refund for No Show. 2) Declaration & Disclaimer Form – will be provided post enrolment. Disclaimer -Nature offers its own challenges from time to time. As Skydiving is an extremely challenging sport, it is possible to have minor/major changes to the designed plan. It is also possible that jumper will have to incur additional costs owing to the challenges.